The rather colorful name of Mesquite Flat was originally submitted when the town applied for a post office in the 1890s. The name Mesquite may have frightened the postal authorities who had no idea if the residents were trying to pull a fast one. The name was rejected. Then (just plain) Flat was submitted -and accepted. The post office opened in 1897. By 1914 Flat was booming with 100 people buying their necessities at three general stores, and ginning their cotton at one solitary gin. By the mid 1920 three quarters of the population left town but by the end of the 1930s they had returned with friends. The population swelled to 125. Population estimates fell to twenty-five in the mid-1920s but rose again to 125 by the late 1930s. With the establishment of Fort Hood, the area farmers lost much of their cropland. Fort Hood would forever dominate the town. Other residents commuted to work at the prison in Gatesville or the hospitals in Temple. The population was just 200 in 1960 and ten years later it was still just 210. The Flat school merged with Gatesville's ISD in 1963 and the former schoolhouse became a community center. Dear TE. I was enjoying your pages about history in Flat, TX when I discovered a mislabeled photo. 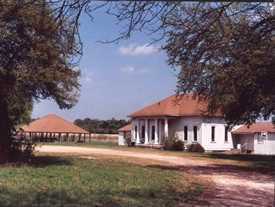 The photo shown is of White Mound Baptist Church in Mound, TX. Photos of the church in Flat are found at www.fbcflat.org. Anyone wishing to share history or photos of Flat, Texas, please contact us.